AQUA uses vacuum distillation to convert seawater into high-quality freshwater for domestic and process utilization on ships, rigs, as well as in remote onshore locations. Desalination of seawater is an economically feasible and reliable solution. 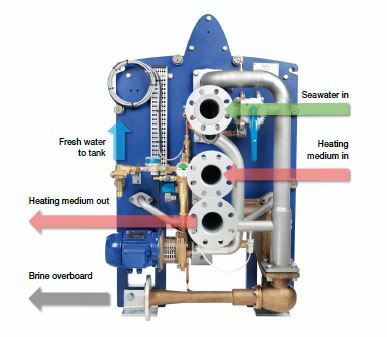 The AQUA Blue freshwater generator is a major advance based on proven Alfa Laval expertise. The AQUA Blue's optimized process cuts seawater needs in half, which minimizes pipework and allows the installation of smaller seawater pumps. This in turn reduces installation costs, fuel consumption and CO2 emissions. The AQUA Blue makes use of 3 in1 plate technology, which enables desalination in a single plate pack with one type of titanium plate. Since the plate pack also contains the process vacuum, The AQUA Blue has no outer shell and is smaller than other freshwater generators. The plate pack slides open for easy access to the interior without an additional service area. The use of corrosion and erosion-resistant titanium, combined with an optimized process that inhibits natural scaling, ensures that AQUA needs little maintenance. The system has been fully tested both on and off shore, and is designed to last the lifetime of the ship. The story of AQUA technology is one of smart innovation that results in energy, space and cost savings. With the Aqua Blue S-type, the benefits are even more remarkable. 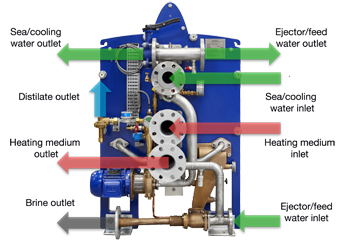 The AQUA Blue S-type has the same high-quality and main components as the original AQUA Blue C-type, but it maximizes energy efficiency and capacity-to-footprint ratio by making use of the vessel’s existing seawater cooling system pumps.This reduces the electrical power consumption to just one-third that of conventional freshwater generators, and it makes the already small footprint even smaller. The AQUA Blue uses vacuum distillation to convert seawater into high-quality freshwater for domestic and process utilization. By providing a constant supply of low-salinity water and continuously controlling the water quality, it eliminates the need for bunker water. The AQUA Blue is designed for automatic operation in periodically unmanned engine rooms and other automated operations. Jacket water, steam injection or a Hot Water Loop can all be used as heating media. The AQUA Blue series covers a capacity range from 3.1 to 60 m3/24 h, depending on the heating medium and cooling water temperatures. An AQUA freshwater generator can be dimensioned to suit any jacket water temperature from 55-95°C at any cooling water temperature. The AQUA Blue freshwater generator consists of a single plate pack containing a flexible number of titanium process plates. These plates are suspended within a frame, which comprises a carrying bar, frame plate and pressure plate. Evaporation, separation and condensation all occur within the same plate pack. Among the plate pack features are gaskets with rubber flaps that indicate correct plate assembly, as well as distance pipes that ensure proper plate alignment and correct tightening. 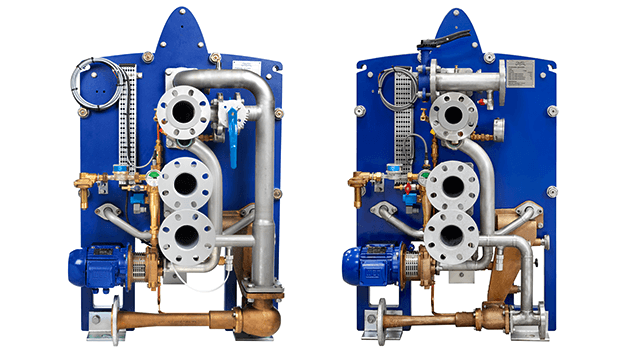 Connected to the plate pack is a combined system for feed water, condenser cooling water and ejector water. The freshwater system consists of a freshwater pump and a freshwater control sensor that ensures a stable outgoing flow. Half the seawater flow - compared to other freshwater generators only half the seawater is needed, which means smaller seawater pumps can be used. Optimized distribution prevents dry spots and inhibits the natural scaling process. Lower costs and emissions - the reduction in seawater pumping needs has a corresponding effect on the consumption of electrical energy. Less fuel has to be burned, which reduces both operating costs and CO2 emissions. 3-in-1 plate technology - The AQUA Blue incorporates the evaporation, separation and condensation processes into a single type of titanium plate. Desalination is handled within a single plate pack that also contains the process vacuum. No outer shell is necessary. Simple, compact installation - with no outer shell and no additional service area, The AQUA Blue has a minimal weight and footprint. Assembly can be handled on site and installation is simplified by the ability to use smaller seawater pumps and pipes. Since The AQUA Blue is not sensitive to roll and pitch motions of ships, it can also be installed in any direction on board a ship. Easy operation and maintenance - The AQUA Blue offers start-and-forget operation, which saves time for the crew. Maintenance intervals are long and the plate pack slides open for easy access to the interior. Long product lifetime - high-grade materials that resist corrosion and erosion, including titanium for the plates and other wetted parts, ensure that The AQUA Blue will last as long as a ship. Low-salinity water - the fresh water supplied has a lower content of salt and other dissolved solids than that supplied by other freshwater generators. It can be used directly by the steam boilers. Continuous quality control - The AQUA Blue's salinometer-equipped control system continuously monitors the quality of the outgoing fresh water. The AQUA Blue C-type's flow of feed water is taken from the flow of seawater coolant. Feed water enters the lower (evaporator) section of the plate pack, in which the plates are warmed by the heating medium. The heating medium is either engine jacket cooling water or a closed circuit heated by steam. Here the water is evaporated at around 40-60°C in a vacuum of 85-95%, which is maintained by the brine/air ejector. The vapour produced rises between the plates into the middle (separator) section of the plate pack, where any droplets of entrained seawater are removed. Gravity causes these droplets to fall back into the brine sump at the bottom of the freshwater generator. Only clean freshwater vapour reaches the top (condenser) section of the plate pack, which is cooled by a flow of seawater. Here the vapour is condensed into fresh water, which is pumped out of the freshwater generator by the freshwater pump. The AQUA Blue S-type has the option to take the ejector and feed water from the condenser outlet or from an alternative source. Feed water enters the evaporator section of the plate pack where it is heated and evaporated. The heating medium is either engine jacket cooling water or a closed circuit heated by steam. The evaporation occurs at around 45-65°C in vacuum of 75-99%, which is maintained by the brine/air ejector. The vapour produced rises between the plates into the middle (separator) section of the plate pack, where any droplets of entrained seawater are removed by gravity and fall back into the brine sump at the bottom of the freshwater generator. Only clean vapour reaches the condenser (which is cooled by sea/ cooling water flow) and are condensed into fresh water. The fresh water is pumped out of the AQUA Blue S-type by a freshwater pump.